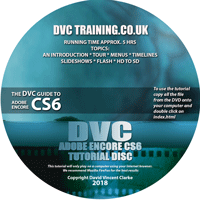 Adobe Encore CS6 tutorial – available for download. This version plays in a web browser on your computer. The download version of this tutorial is approximately 700MB. After ordering you will be sent an email with a link to download the file, which is an exe file. Your email or web browser may warn about downloading and EXE file but in this case it is OK. There is a time limit of approximately a week for you to do this. 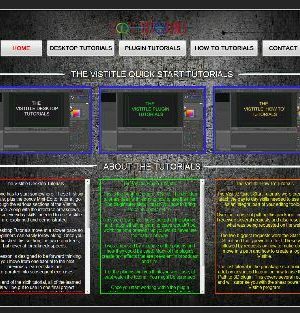 If you have not successfully downloaded the tutorial in this time please email me and I can provide new links for the download. If for some reason you need to download the files in the future just let me know and I will send you some new links. Simply double click on the final file and run the setup program. It will prompt you for where you would like the tutorial installed. It will take about 700MB of hard drive space, and can be saved anywhere on your computer. Once the installer has finished go to the folder where you save the tutorial and double click on the “index.html” file. The tutorial will open in your chosen web browser. It has been tested in Microsoft Edge, Google Chrome and Mozilla Firefox. The tutorial obviously needs an internet connection to be downloaded but you do not need an internet connection on the computer on which it is installed. It will run happily at the same time as Adobe Encore. 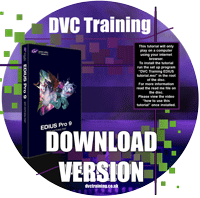 If you have problems downloading or installing the tutorial please email me: david@dvctraining.co.uk. 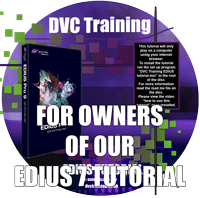 The tutorial is licensed for use by the person who has purchased it. Please do not distribute it without the permission of DVC. I have made this tutorial as a series of individual chapters which are saved as MP4 files, with a front end which has been made to work like a web page. This means is should work on MAC or PC. However, as most of my customers use PCs and to make it easy to installed I have made the download as an EXE file which can only be unzipped on Windows. If you need a version for a MAC let me know and I will make a Zipped version which you can download. The only thing the EXE version does is to make it easy for you to decide where the files should be saved. With a zipped version you will just decide where to put them yourself. The tutorial is divided into several sections to help you locate the information in which you are interested. If learning Encore from scratch we suggest you watch the A Basic Introduction to Encore first as it shows the entire authoring process as well as covering all the main options. The second part to watch would be the Tour of Adobe Encore which explains what all the windows do and how to arrange them. With the other sections we suggest you look at the chapters when needed. A full list of all the chapters in each section and the timings click here. Is this tutorial relevant to the Creative Cloud version of Encore? The simple answer is YES. There is no Encore CC so if you are renting the Adobe software via the cloud you will be using Encore CS6 which is the version covered in this tutorial. The chapters regarding the dynamic link between Encore and Premiere Pro are no longer relevant because you do not get the dynamic link between Premiere Pro CC and Encore CS6. The link still exists between Premiere Pro CS6 and Encore CS6, both of which can be downloaded from the Cloud, but I suspect that if you are using the Creative Cloud you will also be using the latest version of Premiere Pro. However, all the other information contained in our Encore tutorial, including details of how to edit menus in Photoshop etc.. is all 100% relevant to the Creative Cloud version.